I was interested to hear Jeremy Hunt announce on Radio 4 his intention to review the terms and conditions of GPs. I feel this is overdue. Much has been written about the crisis of recruitment and expectation faced by GPs, who, being the most efficient part of the NHS (90% of NHS work done by primary care for less than 8% of the total funding), are most able to drive some of the £22bn efficiency savings demanded by 2020. Being a GP in the UK is a uniquely fulfilling occupation. However, the frustrations and challenges are beginning to threaten a truly rewarding career. So what might bring general practice back to being an awesome career choice? In mulling it over, I considered if I were to be in charge of the nation’s health policy and legislation, what would reduce the frustrations and safeguard the viability of general practice? From a conversations with colleagues emerged the following ideas. Idea 1. Produce and continuously monitor the activity levels of GPs – both demand and access. This would allow for effective planning rather than rhetoric. RCGP has called for this in its blueprint for the new deal for GP in England. Idea 2. Increase remuneration and supply of GPs to enable them to have smaller patient lists to be able to maintain that activity level. In the past 5 years activity has increased by over 40 million consultations per year over the past 4 years. However primary care has seen a similar period reduction in funding from 11% to about 8% of the NHS annual budget. In short a ~13% increase in work for a ~28% reduction in funding. 3.1.2 Re-evaluate the current criteria for ‘free’ prescription entitlement especially with regards to chronic health conditions. 3.1.3 Create a national formulary for use by the NHS. A significant portion of resources both in terms of finance and time can be spent on prescribing issues with significant variation in geography, practice and ethos. Standardising and making these efforts more equitable would solidify the aims of treatment in line with the ethos of fair treatment for all. Additionally a national formulary may help to prevent stock sourcing issues currently facing many GPs, pharmacist and subsequently patients. GPs are primarily contracted to treat the ill and those who believe themselves to be unwell. However, there is currently nothing to stop anyone publicly advising people to attend their GP for any one of a variety of reasons, whether that be the treatment of self-limiting conditions, cosmetic concerns, the prescription of drugs to the well, marginally to extend life expectancy (statins) or even the prescription of boilers. These may or may not be worthwhile, but undertaking this work without adequate resources distracts GPs from those who need them most – the ill.
3.5. Allow GPs only to consult in approved premises except when treating those who are housebound and in the terminal phase of an illness. Home visits and community based resources are both a privilege and a finite resource. They are not a right for convenience particularly with increasing workload pressures and reducing resources. Contractual changes as above would support clinicians offering equitable and appropriate care as already functioning in some areas such as South Staffordshire LMC visiting guidelines. 3.6 Remove fitness certification from the GP role. It is important to provide equitable treatment of patients by appropriately trained clinicians. GPs have a fundamental conflict of interest when it comes to fitness certification. Their duty is to act in the best interests of their patients. This makes it both difficult and uncommon for a GP to challenge a patient’s belief that they are medically not fit for work. Pilots for this are already underway. Remove this duty and free up GP time whilst opening up the possibility of a fairer assessment process. Idea 4. Instead of capitation-based funding, offer activity-based funding to those GPs with a minimum list size determined on the basis of predicted need. Currently general medical services (contract on how primary care is offered) is enumerated at an average of £136 per patient per year- less than a standard Sky TV package. This funding model needs an evaluation given the significant increase in health needs by an ageing population with more chronic disease issues. Many acknowledge the historical advantage of capitation funding in giving GPs an incentive to provide only necessary treatment. However, GPs have now completely lost control of demand. Activity-based funding would give an incentive to every taxpayer to encourage fair use of GP services. Indeed LMC Conference on 22 May 2015 passed a motion supporting exactly this change. Idea 5. Allow GPs to be covered by Crown Indemnity/ reimbursement of indemnity. A growing issue pushing many GPs away from working particularly in out of hours services and deprived areas is the rapidly increasing costs of indemnity cover. Incorporating crown Indemnity or establishing a way to reduce costs (something even outstanding CQC banding can not help with) would facilitate more GPs not being priced out of working in such valuable areas. Precedent may be set with the incoming primary and acute care systems (PACS) as suggested by the Five Year Forward View. The LMC Conference voted for this proposal on 22 May 2015. Idea 6. Amalgamate the GMC speciality and GP registers. This would allow GPs to be recognised for sub-specialising and aid GPs to be viewed as equitable in status as specialist consultants as their training currently allows. This may help to address some of the issues noted in the recent BMA survey (see below) which Government policy changes will not. Idea 7. Exclude General Practice from the NHS. A severe idea with growing support. General Practice as a gatekeeper is central to the NHS. However, unless the GP contract is adjusted to include the ideas suggested above, General Practice and possibly also the NHS will fail. 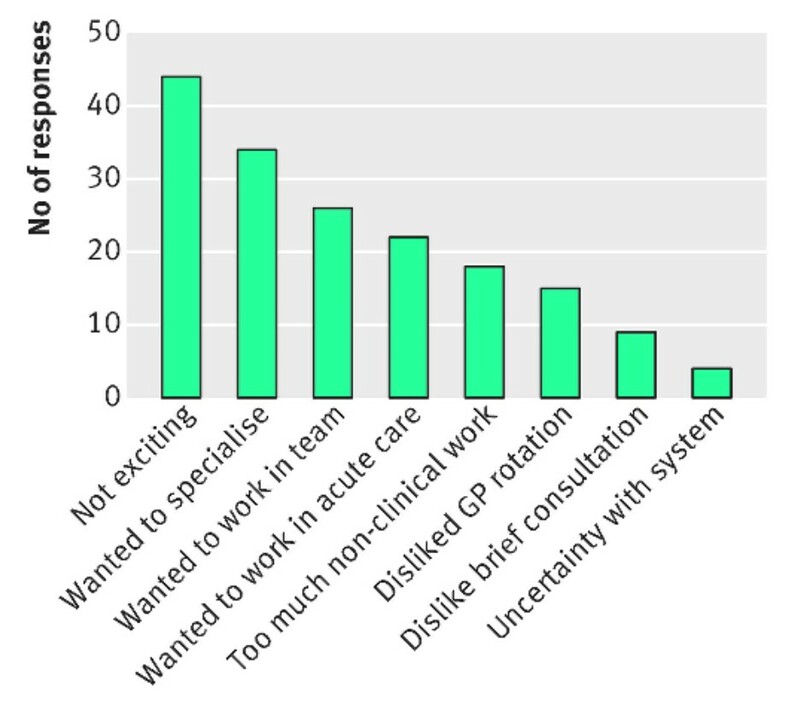 British GPs have unique skills in managing risk pragmatically across an extraordinarily broad range of medical conditions and may have no choice but to reserve these skills for fee-paying patients and health insurers. These are ideas which may or may not resonate with your own thoughts and obviously vary with severity as well as risks and benefits. I am not saying these all have to happen or that they are all miracles that will save both healthcare or the speciality that is general practice. However we are always asked to bring ideas to light and many of these have the possibility of significant impact at a time where the NHS and general practice are in crisis. First published with Dr H Gandhi (+Dr Gandalf) on 23 May 2015 at eGPlearning. I note that the +Conservatives government has paid scant attention to any advice offered by GPs in their New Deal for General Practice.